VASSALBORO -- The newest graduates of the Maine Criminal Justice Academy decided to celebrate their achievement by spreading Christmas cheer. VASSALBORO — The newest graduates of the Maine Criminal Justice Academy decided to celebrate their achievement by spreading Christmas cheer. The group of 60 new officers spent their only weeknight of freedom in more than four months buying nearly 100 toys for underprivileged children. The toys, which the officers purchased with their own money, will be donated to the Fairfield Police Department’s Cops Care for Kids program. 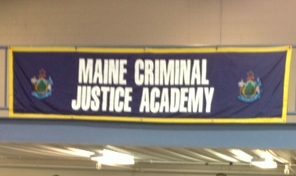 The group of new officers has completed the 18-week Basic Law Enforcement program at the Maine Criminal Justice Academy. The men and women will work as full-time police officers at state and municipal police departments across the state. Warlick, 33, said the class decided to go on the shopping spree after failing to come up with a better plan to celebrate Class Night, which is set aside for every class to celebrate its achievement. Most classes decide to celebrate with a party at area establishments. Their disagreement ended when someone suggested buying toys. He said the group bought 75 to 90 toys, ranging in price from $15 to $50 each. “Everybody agreed the best thing to do would be to take care of people who are more needy than us,” Warlick said. The graduates bought the toys without knowing where they would go. Warlick spent much of Wednesday talking to police and firefighters and town managers for ideas on where to donate the toys. By the end of the day, the group agreed to give the goods to Cops Care for Kids. The graduates delivered the toys before graduation. Warlick said about half of the 60 cadets have children of their own, so buying toys was close to their hearts. That sacrifice was recognized during Friday’s graduation at the academy. Guest speaker Brian MacMaster, a 20-year member of the academy’s board of trustees and head of criminal investigations at the Maine Attorney General’s Office, urged graduates to remember their families, practice sound ethics and seek new training. “Always be mindful of the profound effect that you exert on individual lives, and why such responsibilities can only be entrusted to persons of the highest integrity and character,” MacMaster said.